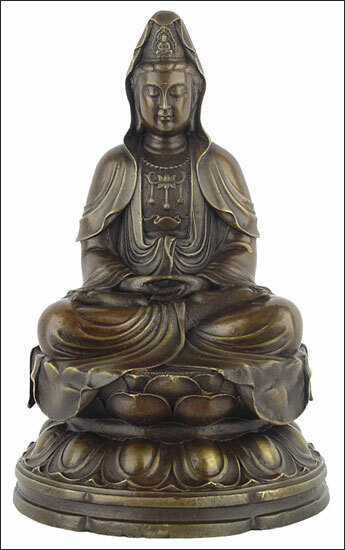 Kuan-Yin, seated Kuan-Yin, Kuan yin, Kuan-Yin statues, kuan yin statues, Kuan-Yin bronzes, goddess Kuan-Yin, buddhist gifts. Kuan Yin, originally known as Avalokiteswara (the Lord who regards), is a highly revered manifestation of the Buddha who appears in Chinese scriptures around 400 a.d. Kuan Yin means "one who hears the cries of the world" and personifies the compassion of the Buddha for the needy. She is the embodiment of the yin principle. She is usually represented as a young female deity but she has the power to assume whatever form necessary in order to carry out her vow which is to appear in any way necessary to lead beings out of suffering. She is often shown holding a vase containing the waters of compassion, the lotus flower of enlightment or the jewel of three treasures.